This week I began taking my first-time ever course, offered by WordPress University. It’s called Blogging 201. It’s aimed at helping people improve blogs or websites that are already up and running on WordPress.com. I need this course a lot! My website isn’t the simple, clean design I’d envisioned. I have no readers or followers from within the the WordPress community…although I don’t know that my site would ever strive for that goal just because of the nature of my content. But everyone likes to have more readers and followers…it signifies that what your doing is worthwhile and useful. So, although the course is half over already and I’m not even fully connected to actually receiving the assignments yet…I am still trying to get ‘into the swing of things‘…in my own way. I’ve always wanted to include a section on my website about learning to create a website, or about becoming a blogger, and the resources I’ve found that might be helpful towards those goals. I decided that now is that time. Some of my content that I believe has better longevity, and that I don’t want to be part of my Blog section, I add to my site as webpages instead of as Blog posts. 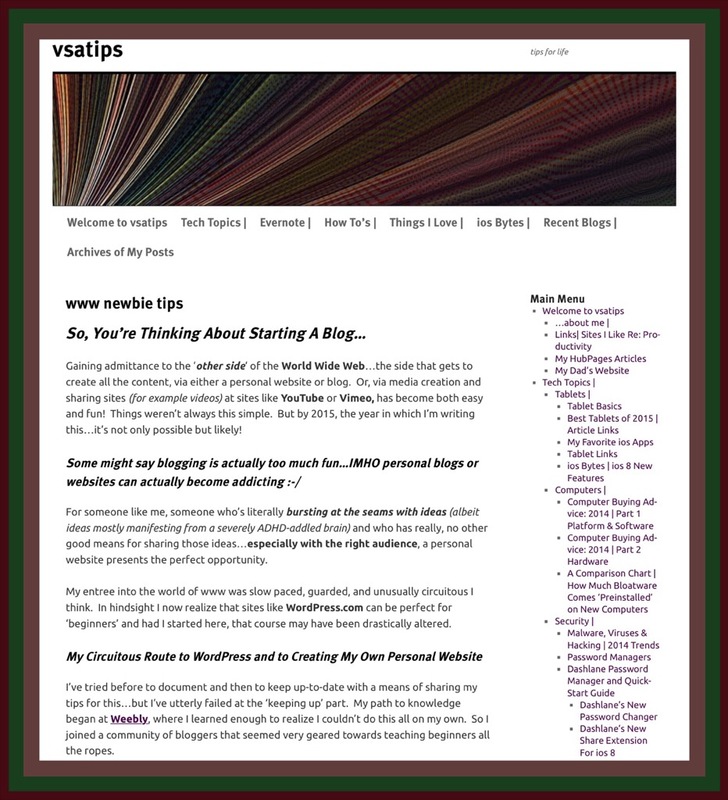 Posts are essentially a running list of my most recent articles, news or tips…they comprise my Blog. Webpages by contrast, are static…they stand alone. I don’t want them to be in my list of Blog posts because those ultimately get pushed further and further down the page as I write new things. I make something a webpage instead of a post when I don’t think that the information will ever get ‘old’ or irrelevant over time. The problem is this: Unlike Blog posts which automatically notify my followers each time I post something new, no one actually knows when I add a new webpage. There is no built in mechanism to notify my followers when a new webpage is added. This isn’t a limitation of just WordPress alone…its pretty much the same everywhere from what I understand. This entry was posted in Blogging, Blogging 201, HubPages Links, learn to blog, Learning to blog, Tech Tips, Things I Love and tagged Blogging 201, Learning to Blog. Bookmark the permalink. I am running into the same issue as I am using a different blog to put my book excerpts and the only way someone will find it currently is to go in my menu under writings. So intil I find a workaround, I will just have to post the link in the blog my followers follow. Heck..kinda clunky. I thought of adding pages under my main blog but clunky and cluttered as well since you can’t make multiple posts under one page. Ohhhh…hours to the next assignment but..I’m caught up except for the editorial calender. I know what you mean. Clunky is an understatement! It’s not ideal and I’m sure there’s a better way, but I haven’t figured it out yet.